San Francisco, Calif. (Nov. 14, 2018) — Kimono Refashioned is a new special exhibition at the Asian Art Museum that explores the impact of kimono on global fashion, from the Victorian era to the digital age. 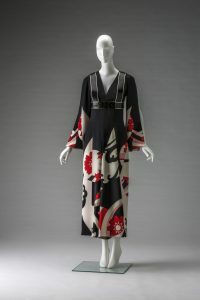 Spotlighting more than 40 ensembles, accessories and artworks from close to 30 designers and artists — including innovators like Paul Poiret, Coco Chanel, Issey Miyake and Tom Ford — Kimono Refashioned tells the story of the globally interconnected world of high fashion. This infusion of an appealing, distinctly Japanese sensibility into contemporary clothing continues today with Iris van Herpen’s 2016 space-age take on shibori tie-dye and Christian Louboutin’s 2017 boots embroidered with cranes and plum blossoms. Issey Miyake gets at the conceptual heart of kimono in his “A Piece of Cloth” designs, which reinterpret its essential flatness. Japanese manga and anime have likewise inspired fashion trendsetters around the world, such as Jonathan Anderson, who employed a Gundamrobot motif in his recent playful “pop” men’s suits for Loewe. 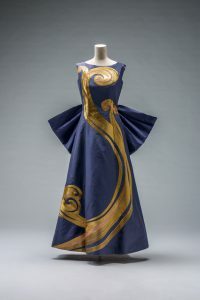 This exhibition was initiated by Akiko Fukai of the Kyoto Costume Institute, and was jointly curated by Rie Nii of the Kyoto Costume Institute, Yuki Morishina and Karin Oen of the Asian Art Museum of San Francisco, Katherine Anne Paul of the Newark Museum, and Cynthia Amnéus of the Cincinnati Art Museum. The exhibition premiers at the Newark Museum (Oct. 13, 2018–Jan. 6, 2019) before traveling to the Asian Art Museum (Feb. 8–May 5, 2019) and then to the Cincinnati Art Museum (June 28–Sept. 15, 2019). Kimono Refashioned is co-organized by the Kyoto Costume Institute and the Asian Art Museum of San Francisco. Presentation is made possible with the generous support of The Bernard Osher Foundation; The Akiko Yamazaki and Jerry Yang Fund for Excellence in Exhibitions and Presentations; The Henri and Tomoye Takahashi Charitable Foundation; Paul and Sandra C. Bessieres; Michele and Joseph M. Alioto; Joan L. Danforth; Warren Felson and Lucy Sun; Fred Levin and Nancy Livingston, The Shenson Foundation, in Memory of Ben & A. Jess Shenson; Allison and Dan Rose; Tania and Michael Stepanian; and The Japan Foundation.